Here are two photos of Anamalai Avenue. The top photo is from the PictureSG website hosted by the NLB. 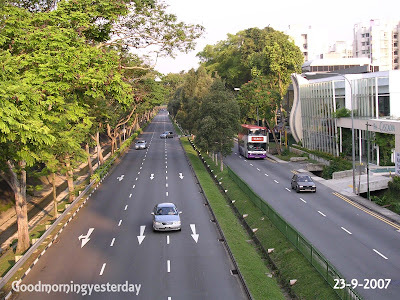 It is accompanied by the following explanation; “This 1993 photograph shows Bukit Timah Road, towards Anamalai Avenue (southwards).” Actually, I think this explanation is incorrect. 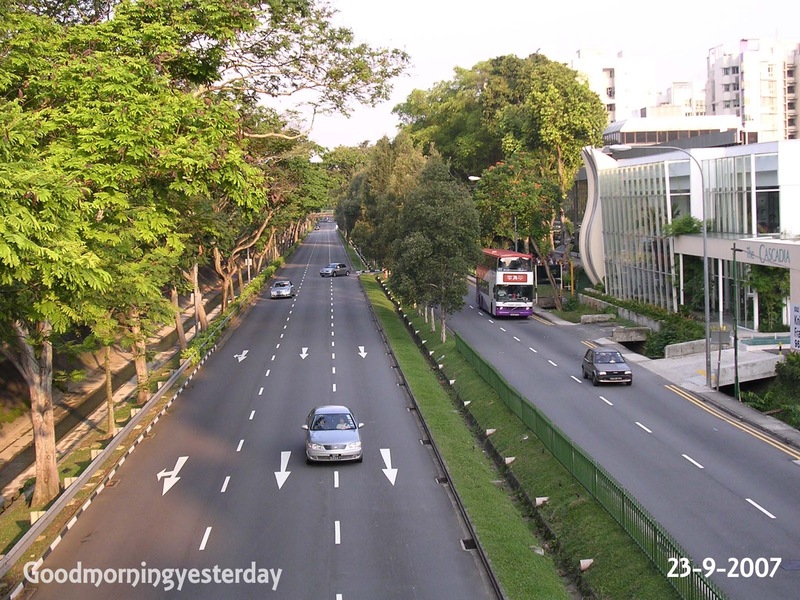 The photo actually shows Anamalai Avenue towards Bukit Timah Road. You can refer to the second photo which was taken by me earlier this month. On the left of this photo is the Royalville Condo. Beyond this is Bt Timah Rd and behind the trees is the Bukit Timah Canal. As you can see, the old shops are all gone. 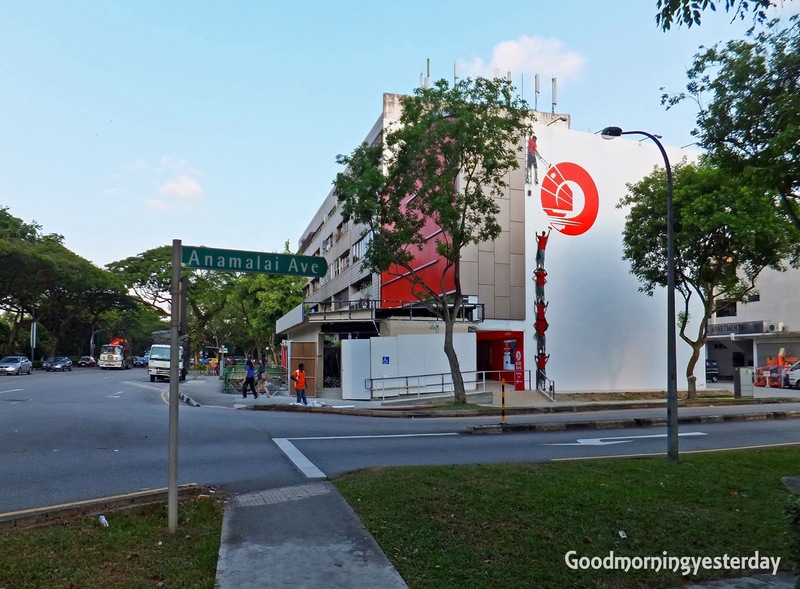 In its place is a new building which houses a branch of the OCBC Bank. Previously, the bank was located at the other end of Sixth Avenue Centre, nearest to the traffic lights. Do you know what was the name of this bank previously? 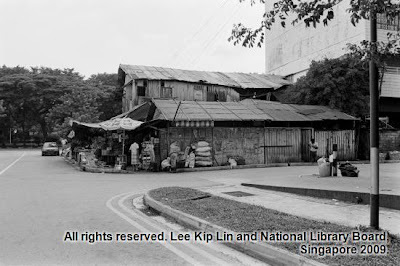 It was known as Keppel - Tat Lee Bank. And before that, it was simply Tat Lee Bank. 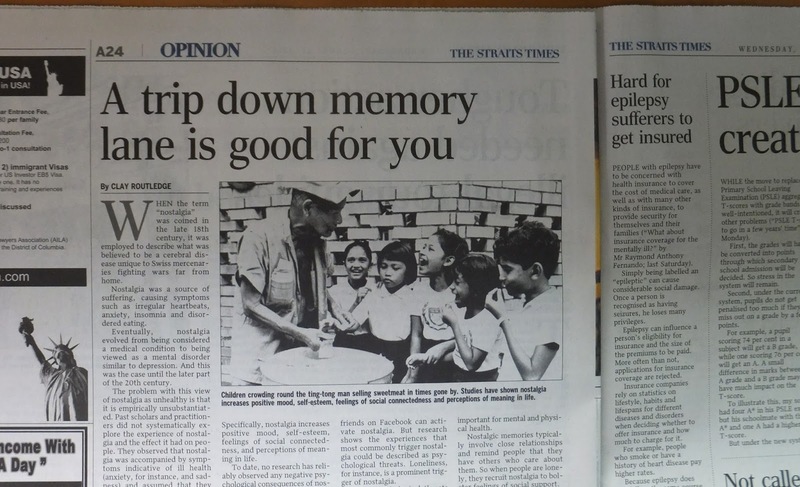 Did you read this article in yesterday’s Straits Times? It reinforces what I have been telling people. 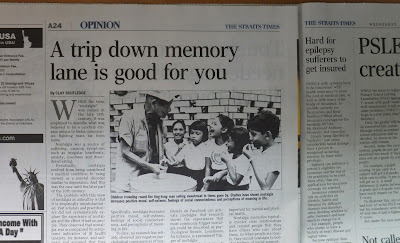 Nostalgia is good for health. 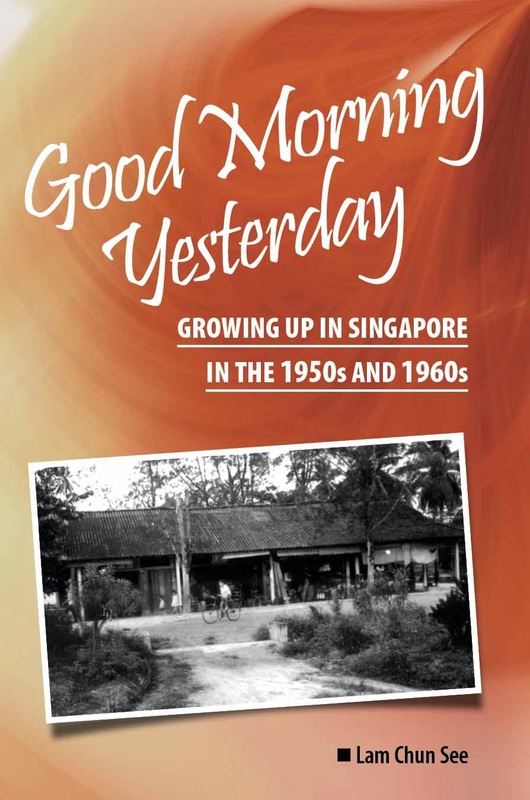 So, why not head down to Books Kinokuniya @ Ngee Ann City (Tel: 6737-5021) and grab a copy of my book Good Morning Yesterday. While there, get another copy to give to your friend. Together, let us take a trip down memory. You can read the above article which first appeared in The Conversation here. Don’t forget to remember …. the times of your life. 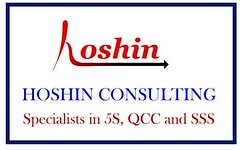 Take a look at this photo. 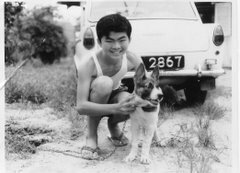 Do you know where it was taken? The next time you travel along Sixth Avenue, from Holland Road towards Bukit Timah, look out for this place. 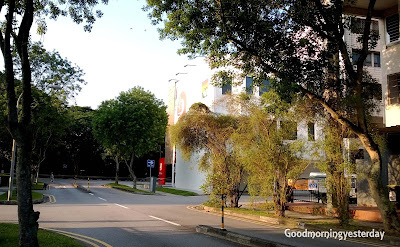 It is near a bus stop before you reach the junction with Jalan Haji Alias and Laurel Woods Avenue. ﻿﻿Did you know that this is actually the start of a road that used to run from Sixth Avenue to Holland Road? The other end of this ‘lost road’ was at the winding stretch of ‘old’ Holland Road, between Holland Green and the unnamed canal that flows from Bt Timah Canal to Ulu Pandan Canal. 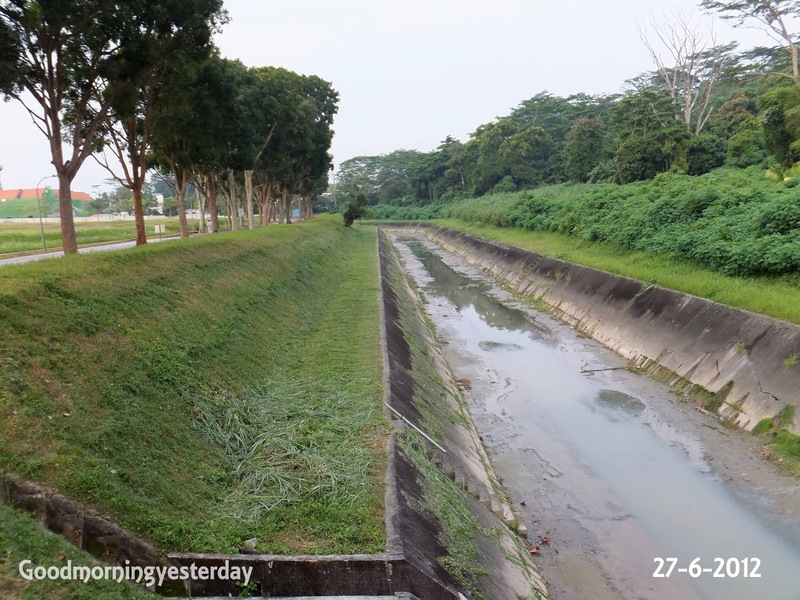 This second entrance has just been erased by ongoing construction; presumably to widen the canal as part of the Bt Timah flood alleviation project. 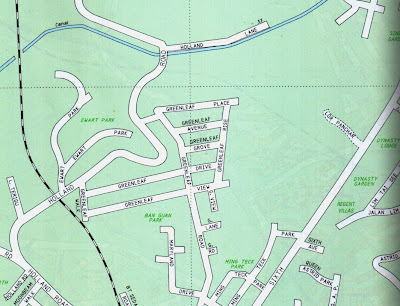 And the name of this ‘lost’ road? Lorong Panchar. 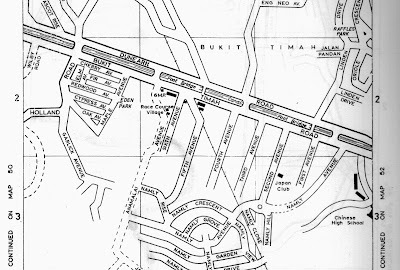 A section of Lorong Panchar (From 1981 Street Directory).Click on image to see an enlarged view. 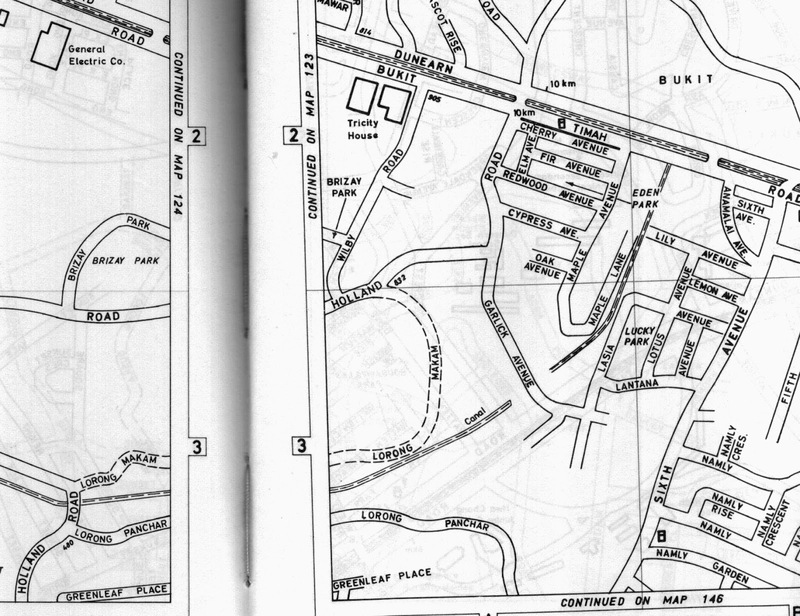 Lorong Panchar probably did not exist for long because I could not find it in my 1963 street directory. 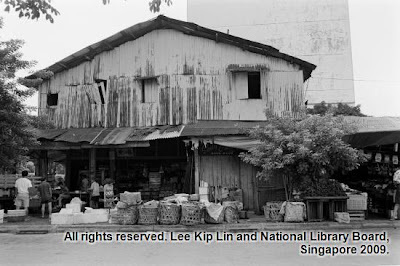 In fact, at that time (1963), Sixth Avenue was only a tiny side road that branched off Bukit Timah Road and did not join to Holland Road. 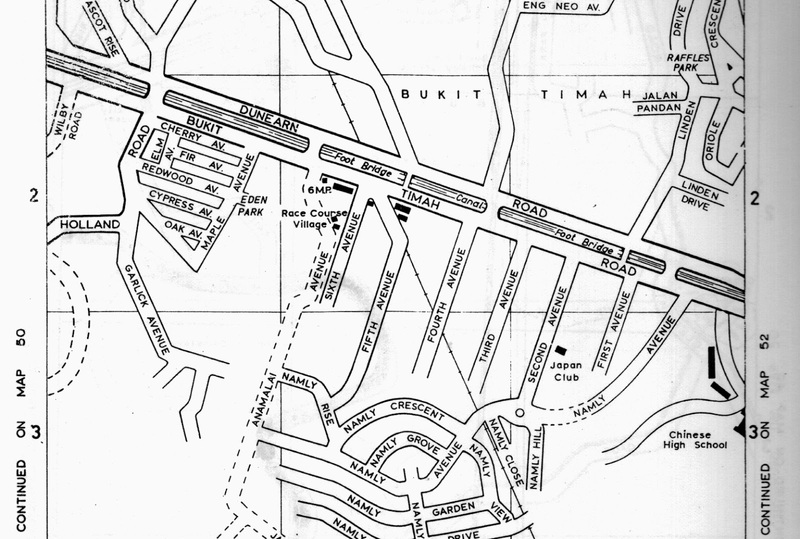 And in my 1993 street directory, only a tiny section of Lorong Panchar was left. Hence I conclude that Lorong Panchar only existed for about twenty years or so. Unfortunately, even though I have been living in the Sixth Avenue area since 1986, I don’t have any recollection of this road. From 1963 Street Directory. Lor Panchar not shown. 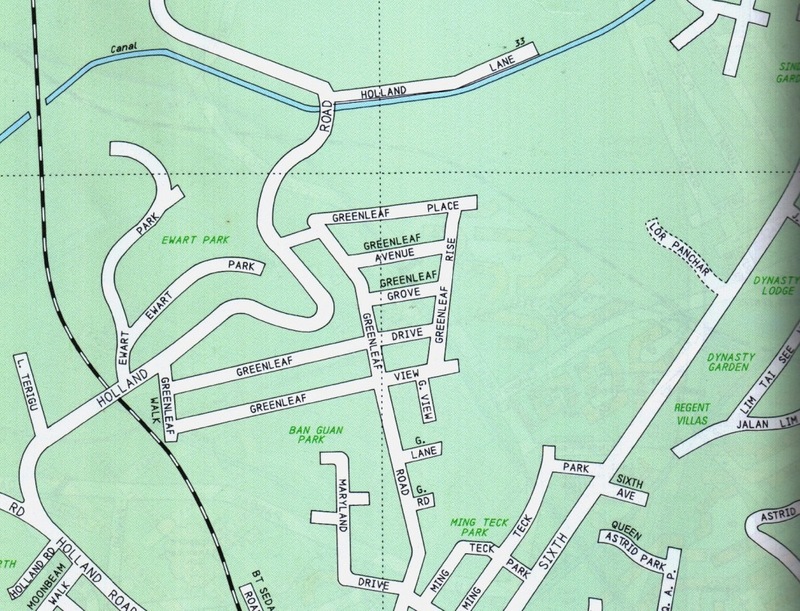 From 1993 Street Directory. Only a tiny section left. 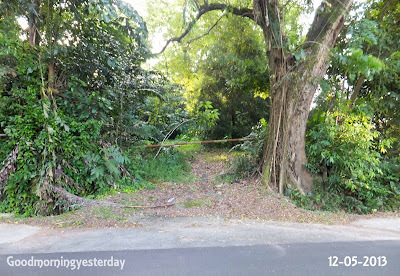 A couple of year ago, my neighbour and I tried to bash through the forest that had covered Lorong Panchar, starting from the Sixth Avenue junction. He told me he had seen some durian trees there and also the remains of a huge tomb. Unfortunately the vegetation was too thick and we never found anything interesting save the shed skin of what must have been a pretty large snake. 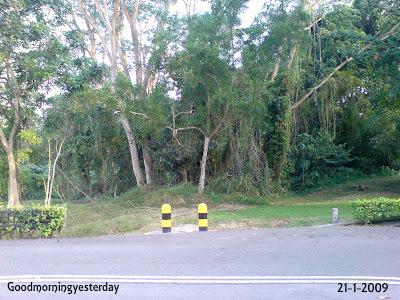 We finally emerged from the forest at a point near the canal next to Holland Plain. 2) A stretch of Pioneer Road. Take a close look at these 2 photos. 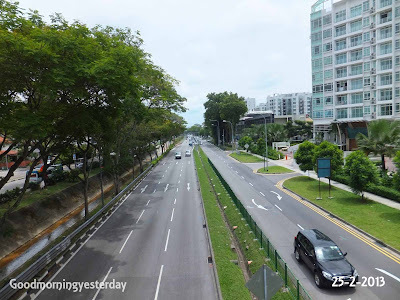 Taken from the overhead bridge at Bukit Timah Road, they show a stretch of the road just in front of the Cascadia Condo. Can you spot the difference? Yes. It’s the row of trees. 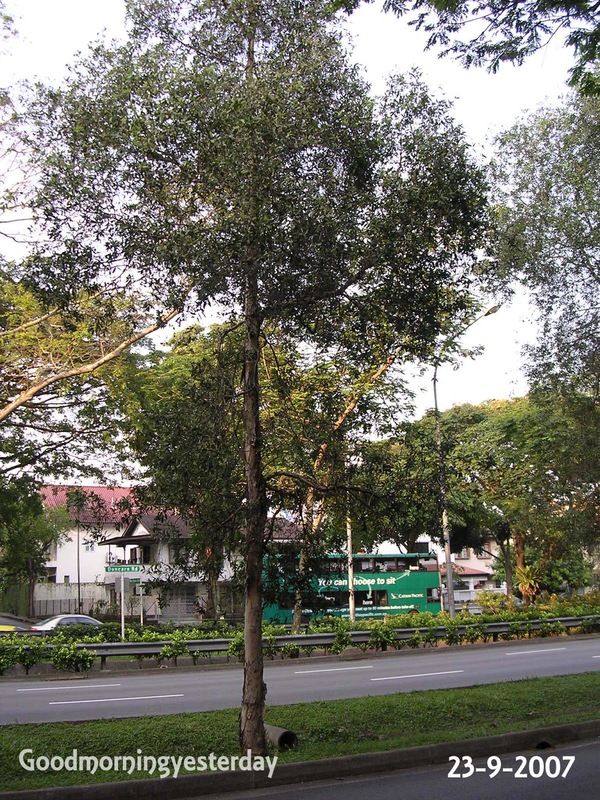 This type of tree is known as Glam Tree, and the name of Kampong Glam is actually derived from the name of this tree which used to grow freely in Kampong Glam. 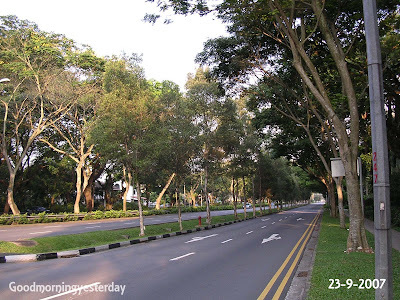 Check out my friend James Tann's photos of Kampong Glam here. 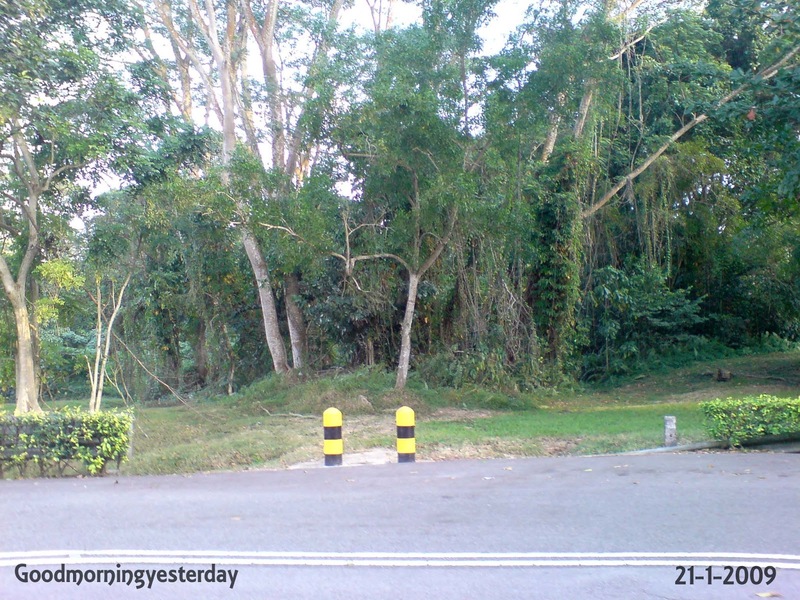 It was my friend, Dr Tan Wee Kiat (not the one from Nparks) who first drew my attention to these interesting trees in Bukit Timah. Thanks to him, I am able to share with you some photos of these trees that have since been cleared in the name of progress.